Lemons and raspberries — ok, these are not really fall flavors, but I just had to share these Lemon Raspberry Muffins before the new season is fully upon us! This is a great way to use up those fresh and tangy raspberries you may still have, or you can even use frozen to extend the life of this scrumptious recipe! These muffins are great for breakfast, snacking or even as a dessert. My family loved the sweet and tangy flavors — and so did I. And did I say lemon, yes, there is a lot of lemon in these Lemon Raspberry Muffins — so pucker up and get ready to treat your taste buds! Preheat oven to 350 degrees. Line 24 muffin cups with paper liners and set aside. Combine flour, sugar, baking powder, and salt in a large bowl. In a small bowl, add the raspberries with the 1 tablespoon of flour, toss gently to combine and set aside. In another bowl, whisk the eggs, buttermilk, butter, lemon juice and zest. Pour the wet ingredients into the flour mixture and mix with a spatula until just combined. Then gently fold in the raspberries. Do not over mix. Evenly divide the batter among the 24 muffin cups; about 2/3 full and bake for approximately 18-20 minutes. To make the glaze., in a small bowl, whisk together the confectioners sugar and lemon juice and zest. If glaze is too thick, add another tablespoon of lemon juice. After your muffins have cooled slightly (5-10 minutes), spoon the glaze over the muffins. For the lemon sugar, add the sugar and lemon zest and mix until thoroughly combined. Sprinkle over the top of the muffins. Serve immediately! 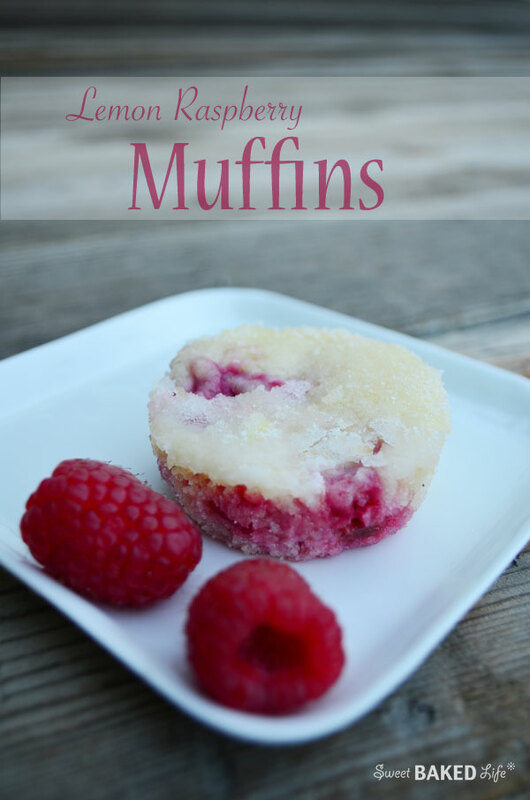 All that I can say is that if you love lemon and raspberries like me, then these Lemon Raspberry Muffins are a sure way to your heart! Previous postHonored: Very Inspiring Blogger Award!